The darkroom is the place of creation par excellence. It is the place where I spend most of my time: I estimate that I spend there no less than five months a year. Even though I was lucky enough to assemble a darkroom according to my personal needs – and so the result is very close to my ideal also in terms of comfort – the transition from the vast distances and blazing lights of Everest to the darkness of an enclosed room has been a drastic – and sometimes painful – change of life. Once again I have to be grateful to the mountains for the severe discipline that they taught me to attain difficult goals if today I feel myself so at ease in such an unnatural place. The hard daily work in the darkroom is like a Zen exercise that let me discover new inner dimensions. The art of patience, observation, reflection and judgement are intensified to the utmost degree in this solitary room that hardly looks like a place where beauty and harmony can be created. 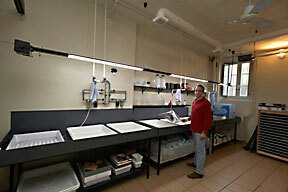 A darkroom requires a lot of technical equipment and also tailor-made electric and plumbing systems. There are: the enlarger, the tanks for the chemical treatments, trays of various sizes, tanks for developing the negatives, the vertical tanks for the final wash of the prints, the rack to let the prints dry, and then the chemical stuff, the papers, the cutter, bottles, graduated tubes, funnels, thermometers, timers, a focusing magnifier, the enlarger´s margin stop, safety lights, a special case with a fan to dry the negatives. Not surprisingly, it is necessary to dispose of quite a big room, and in addition this room needs to be completely blacked out (and this is more difficult than one can imagine). Today in our cities we live in smaller and smaller apartments and space is getting more and more precious, so it is easy to guess why it is more and more difficult to afford a darkroom. And this is one of the reasons why many photographers have given up printing their own negatives and why traditional black and white photography has less adherents.